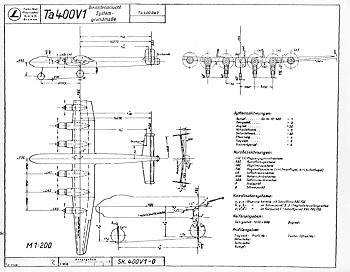 In 1943, work was begun on the Focke-Wulf Ta 400 by the Technique de Chatillon, a construction community of over 300 French technicians (controlled by Focke-Wulf) who were accomodated in Chatillon sur Bagneux, a southeast suburb of Paris. A number of firms in France, Germany and Italy were commissioned to design and construct the major components. 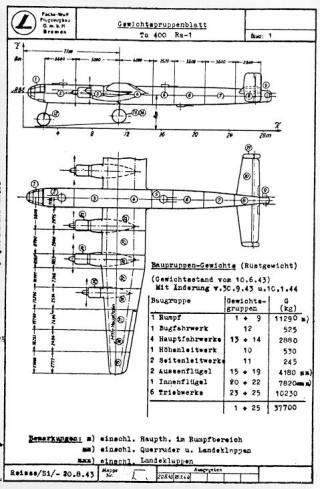 The Ta 400 was envisioned as a bomber/ longe-range reconnaissance aircraft, and was to be at least partly used to help the U-Boat services. The wing was shoulder mounted and had a 4 degree dihedral on the outer wing panels. Six BMW 801D radial engines each providing 1700 horsepower were mounted on the wing leading edge. A later design featured two Jumo 004 jet engines beneath the outer most radial engines. There were two pressurized sections in the fuselage, one in the forward section which encompassed the cockpit and one in the fuselage rear section for the operator of the rear rotating turrets. Two view domes were mounted on the fuselage sides to facilitate remote-controlled gun aiming. 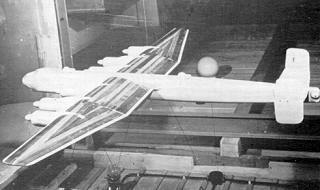 The tail was of a twin fin and rudder design, and the tailplane incidence could be adjusted hydraulically. 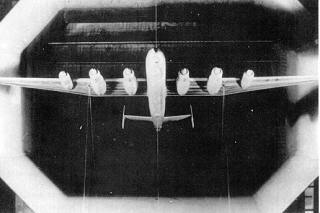 The fuel was stored in 32 tanks, 12 in each wing and 8 in the fuselage, for a total of 27000 liters (7133 gallons). The undercarriage was of a tricycle arrangement, with a single nose wheel that retracted to the rear and four main wheels (one under each engine) that retracted forwards. A crew of nine manned the plane, and the defensive armament consited of one remote-controlled turret beneath the fuselage (two MG 151 20mm cannon), two remote-controlled turrets on the upper fuselage (two each MG 151 20mm cannon) and a remote-controlled tail turret mounting four MG 151 20mm cannon. The range was to be 4800 km (2981 miles) with a bomb load (see table below for possible bomb loads) of 10000 kg (22000 lbs).